Arabella01263 715779work01603 870304fax Self-cateringThis wonderful traditional farm barn conversion has been highly praised by previous guests. Customers can enjoy a large games barn with snooker table, pool table, table football and play area. Only a few steps from the front door are a multitude of beautiful walks through the owner's tracks and water meadow. This particular cottage retains a traditional aesthetic, providing a tranquil stay. • Other: Towels, Travel cot, Books and games provided. Access to tumble dryer and outside drying area. Notes: £100 security deposit, payable on arrival, when booking three or more properties. Layout of the first floor galleried bedrooms more suited to family use. 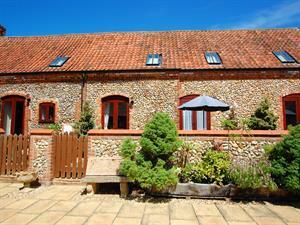 This wonderful traditional farm barn conversion has been highly praised by previous guests. Customers can enjoy a large games barn with snooker table, pool table, table football and play area. Only a few steps from the front door are a multitude of beautiful walks through the owner's tracks and water meadow. This particular cottage retains a traditional aesthetic, providing a tranquil stay.